Although addiction treatment can improve your quality of life, many people never get help. Some people who struggle with drug abuse are afraid of the discomfort that accompanies detox programs. Others don’t know where to start. Learning the importance of detox helps you take the courageous first step toward recovery. Why Should You Start With Detox? Research shows drug addiction treatment can be highly effective for individuals attempting to maintain sobriety. However, only about 10 percent of people who struggle with drug abuse get treatment. A high-quality rehab center incorporates several addiction therapy components. Because drug addiction is complex, multifaceted treatment works best. No matter what type of rehabilitation you undergo, you’ll start by eliminating chemicals from your system. Drug addiction is not a matter of staying strong and avoiding the urge to use. Many drugs alter the way you think even after one use. No matter how much therapy you go through, you might still be at the mercy of powerful chemicals if you don’t eliminate them from your body first. Detox programs provide a safe environment for going through withdrawal. When your body acclimates to functioning under the influence of certain chemicals, quitting disrupts your equilibrium. For example, alcohol and benzodiazepines could cause deadly withdrawal symptoms when you eradicate them from your system. When going through detox, you’ll have access to professional supervision, medical, and psychological treatments that help ease the process. Overall, programs vary in length and intensity. For some people, outpatient programs are ideal. They may visit a rehabilitation center to receive medication or visit a therapist but return home at the end of the day. However, those with more serious addiction disorders may choose an inpatient detox program instead. At 1st Step Behavioral Health, each client is assigned a primary care therapist. This individual determines the ideal recovery plan for your unique needs. 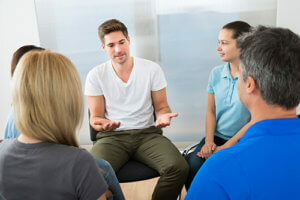 Thus, the detox process is different for every person and depends on addiction severity, the drug of choice, and underlying mental health conditions. Therefore, we strive to provide custom drug addiction treatment that addresses all patient needs. While you may have access to professional support during detox, the recovery process begins with you. Above all, your dedication to sobriety is vital to your success. After you’re ready to attend a detox program, you’ll go through an evaluation process. It’s hard to be honest about your drug use. However, at 1st Step Behavioral Health, we are here to care for you, not judge you. We understand the specific addiction struggles you’ll face and that this is a vulnerable time for you. Therefore, it’s imperative you give us accurate information so we can develop a program that’s right for you. It’s our mission to help you make the transition to a drug-free, safer life. Although you may eliminate drugs from your system within a few days or weeks, the psychological and emotional effects of substance abuse can linger. Thus, treatment after detox is absolutely vital to your continued sobriety. Call 866-319-6126 today to begin your personal path to recovery.